I haven’t really tested any road specific fatbike tires other than the Vee Rubber Vee 8, which is only a ‘road tire’ in that it’s pretty much useless for anything else. The Vee 8 competes with the Vee Rubber Mission 4 as my least favorite fat bike tire of all time. The Duro was shipped mounted on a 100mm (4 inch) fat bike rim on my Burning Chrome 3000W Cyclone build. 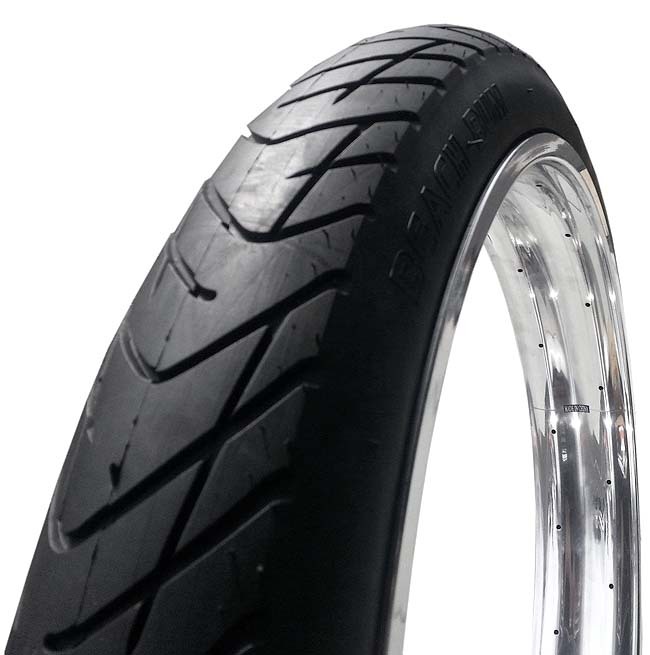 I have seen the Duro tire Beach Bum on several fat bike cruiser bikes stretched onto wider rims, and it seems to me that fat bike manufacturers are using this tire because it’s cheap and there is very little out there in for fat bike tires that have a similar road-specific tread. How does the Duro handle on the road and in the dirt? Not as well as it should, and not well enough that I would ever recommend this tire to anyone that I liked. When I first took out my Burning Chrome bike on the road and started tooling around at 35mph I noticed the 60TPI tires were pretty inconsistent in shape. At lower speeds you don’t really notice it, but up around 35+ mph the tire starts to wobble pretty badly. For a 2220g wire beaded tire I expected more consistency. Most of the Surly and Vee Rubber tires do not wobble or feel that unstable at those speeds. To be fair I did pump the pressure up to the 20 psi, the maximum tire pressure that was recommended. I’m sure that Duro never planned for people to be going that fast on these tires as well which constitutes a serious safety risk. The rubber on the tire seems incredibly thick, and even the sidewalls are pretty thick, which is good because when you stretch a tire onto a rim this wide whenever you are cornering you’re basically riding on the sidewall. This tire is useless in soft sand, you should opt for something with some serious tread, but it does fine on hardpack. I tested it with a pretty heavy gauge tube, although I’m sure you could also rig this tire up to be ghetto tubeless. The Beach Bum certainly looks cool, and it’s sure to get lots of attention from the ladies, if that’s what you are into. I haven’t found any street slicks for my commuter fat bikes yet that are any better than the Duro. It seems to me that the best tires to use are the ones in your junk pile, as going 35+ mph on summer pavement at 20psi is sure to wear the tread down faster than you can say “hot rubber”. My feeling is that the 3″ tire stretched on the 4″ rim loses you a lot of the bounce and suspension that the 4″ tire affords you. Without springs and shocks you are left with only the tire depth when it comes to absorbing pot holes, road debris or groundhogs. I actually hit a 40 lb groundhog once that ran across the road when I was going 30+ mph. It was insanely scary, but I managed to bunny hop over it at the last second and it was barely grazed. Because you are going stupid fast on ebikes and are completely silent you should expect that animals are going to throw themselves in your path. Don’t they know I’ve been a vegetarian for 30 years on principle? Powder – 1 : You’re joking right? Mud – 1 : See ‘Powder’ above. Ice – 1 : See ‘Mud’ above. Singletrack – 1 : See ‘Ice’ above. Sand – 3 : Decent on hardpack, useless in the really soft sand. Road – 4 : As long as there is no gravel, you keep it under 25mph and there is no snow, ice or road obstructions. Rolling Resistance – 5 : The lowest I’ve tested. Weight – 3 : Way too heavy at 2220g claimed for a 3″ tire. Too lazy to pull off the tires off my bike and actually weigh them. So there you go, another crappy fat bike tire review from that crazy guy who loves to hear himself type. Nice post Karl. Have you tried the Black Floyds yet? I almost bought a pair about a year ago but then I didn’t. How awesome are they? I’m happy with my other Surly tires but the rubber seems to wear faster than the Vee Rubber treads. You rate this road tire poorly for conditions that only a more knobby tire would preform well in. As it has a tread of a roadbike tire. What would you recommend for a Fat Tire for a bike like you post above, a cruiser that you will mostly ride on the road? This tire works very well on the road. The hookworm is another good choice. 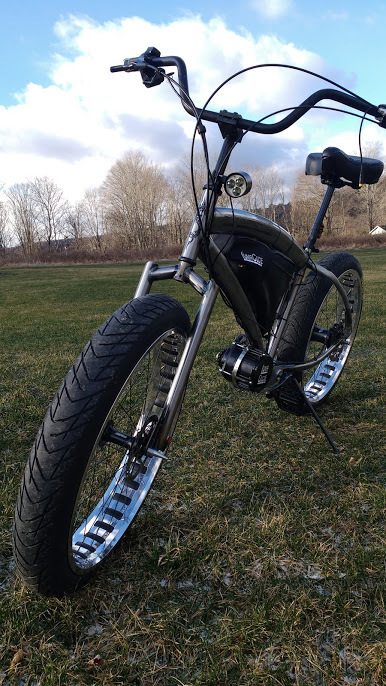 The tires on the Luna Banana are the best fatbike road tires I’ve seen and are some kind of thick 20″ moped tire.